Five primary co-operatives came together on 26 August 2004 to form the Entreprise Coopérative Kimbre, known as ECOOKIM. ECOOKIM is a union of seven primary co-operatives located in rural communities across four regions of Côte d’Ivoire. Its members produce cocoa and coffee for export which is sold exclusively to ECOOKIM. Under pressure from the World Bank and IMF, Côte d’Ivoire began dismantling state control and liberalizing its cocoa and coffee sectors in 1999. The government put in place policies and legislation to organize and promote development of the co-operative movement to strengthen the position of small-scale producers in the international market. Despite these incentives, the co-operative movement failed to be reinvigorated, generally remaining ineffective and operating in a fragmented and uncoordinated manner. Many co-operatives were failing to actively purchase and market their members’ crops or provide technical support and other services. A group of co-operative managers, themselves the sons of smallholders, were convinced that the future of cocoa and coffee lay in farmers working together to improve their incomes and living conditions, rather than individually. They decided to take on the challenge of creating an effective co-operative union based on true co-operative principles and working with farmers, including their own parents, who were enthusiastic about being part of an effective organisation that aimed to ensure farmers received a greater share of the profits from their crops. ECOOKIM’s member co-operatives are located in regions that attract high numbers of immigrants from neighbouring countries including Mali, Guinea, Liberia and Nigeria looking for economic opportunities. The regions typically have high unemployment and poor healthcare, with environmental problems such as deforestation, soil degradation and water pollution. 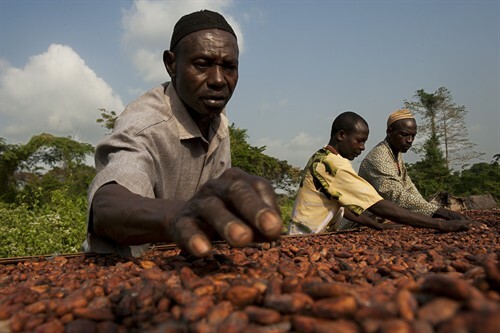 The unstable political situation in Côte d’Ivoire causes intermittent political unrest – most recently, the post-election civil war of 2011 disrupted cocoa exports and pushed world cocoa prices to record levels. Poor local infrastructure is an ongoing problem. Roads are poorly maintained and vulnerable to flooding in the rainy season; the nearest health centre is typically 10km to 15km away and the nearest hospital 15km to 30km; children travel 10km to 30km to attend primary school and 40km to 70km if they are fortunate enough to go to secondary school. ECOOKIM members have a production capacity of around 7,000 tonnes a year but this varies according to weather conditions, fertiliser applications and incidence of pests and disease. Supply can also be disrupted by external factors such as the post-election conflict that contributed to a reduced crop of 2500 tonnes in 2010/11. Of the 7,020 tonnes produced in 2012/13, 3,154 tonnes were sold to Fairtrade buyers and 3,866 tonnes to the conventional market. Primary co-operatives employ a few permanent office staff, supplemented by temporary staff at busy times. Farms generally rely on family labour but employ a few seasonal farm workers at harvest time. The General Assembly (GA) is the union’s highest decision making body and is made up of all co-operative members. An eleven-member Board of Directors is elected every three years and is responsible for implementing decisions made by the GA. The board appoints a management team to oversee the day-to-day running of ECOOKIM. Each primary co-operative is similarly managed by a Board of Directors responsible for implementing decisions made by their respective GA. Forced labour and child labour are prohibited. ECOOKIM made its first Fairtrade sales in 2011, selling 375 tonnes from the 2010/11 crop to the Fairtrade market, This increased to 3,154 tonnes in 2012/13. The Fairtrade Premium from these sales is distributed to the primary co-ops where the General Assembly of members decide how it will be used. Provision of organic fertilisers to increase the sustainability of cocoa production. Training programmes to improve productivity and quality. Programmes to raise awareness of child labour issues. Despite government initiatives, cooperatives still have many organizational and financial difficulties. The establishment of the ECOOKIM union is a framework for the development of marginalized producers through the production and marketing of cocoa and coffee. The Fairtrade market represents real hope for the business and organizational development of member co-operatives and the economic development of their communities.